Was hoping to have finished this last Thursday, when Tuesday morning I suddenly found myself with almost no energy because of something that happened Monday night. I have no control over the whole situation and rather not go into that here. Plus, I’m pretty sure everyone who follows me on Twitter, who follow this, want me to stfu about it. The friend I’m doing this for said to take my times, so there is much less pressure on me. I want to be done with this soon, so I can give it to him and be finally done. I’m having issues attaching the sides to the back. Once I’m past that, the rest will be a breeze. I finished the pillow for my cousin. It’s really simple and I’m chuffed it looks pretty decent. My sewing skills need more practice, at this point in time. 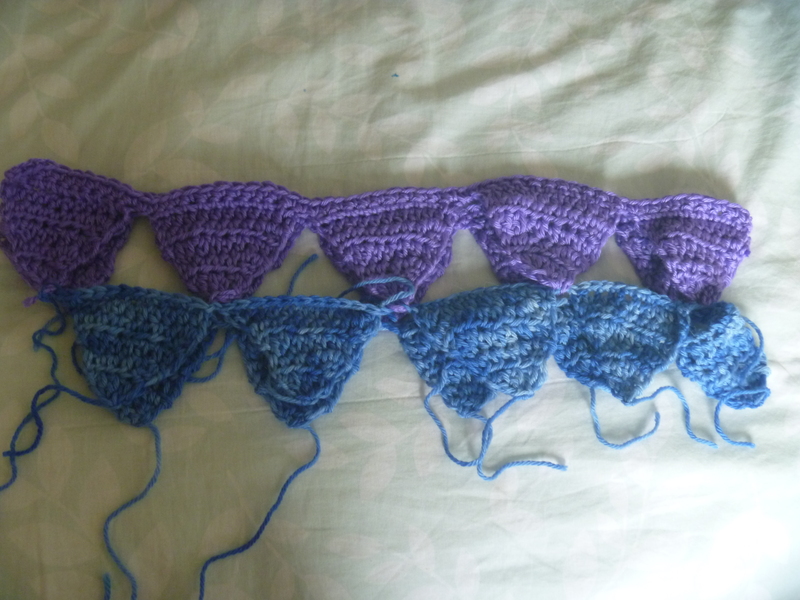 I’ve not finished up all the triangles, but started attaching each row. To take a picture, I folded it in half. The second row down’s bits aren’t weaved in. 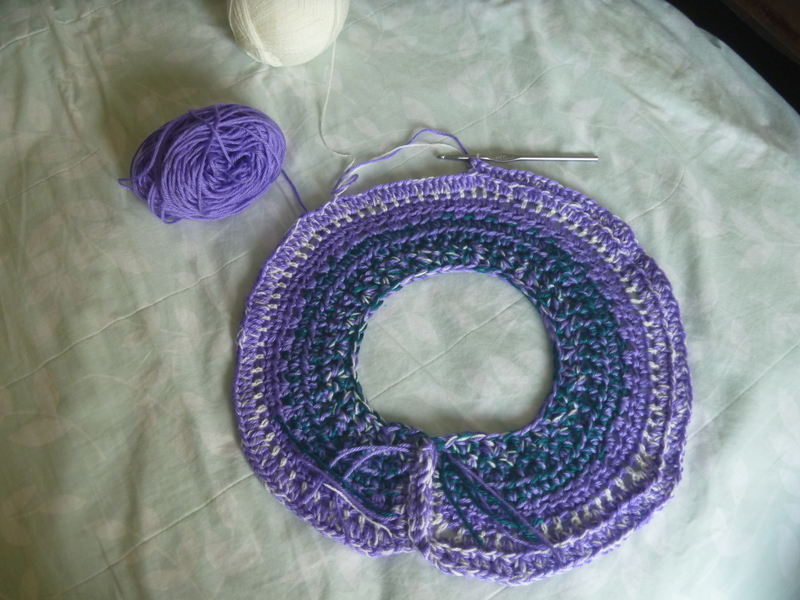 It looks a bit odd, but will look much better when it’s finished and blocked. I had so much fun knitting The Knob House, that I’m knitting a second house. I’m not doing it the same way as last time. In case, anyone was wondering, I decided to go with Big Cartel for an online shop. Looks like I need to change the seller’s permit but I’m good with the other stuff. For the time being, it will be under my name. Need to call BOE tomorrow. It would be annoying if I have to completely fill out a new permit with everything the same except the name. I do like the other name but I’m tired of waiting. It’s hard but I need to have more faith in myself. I’ve been putting it off and it’s time. When it’s finally open, I’ll link to it in my About page. 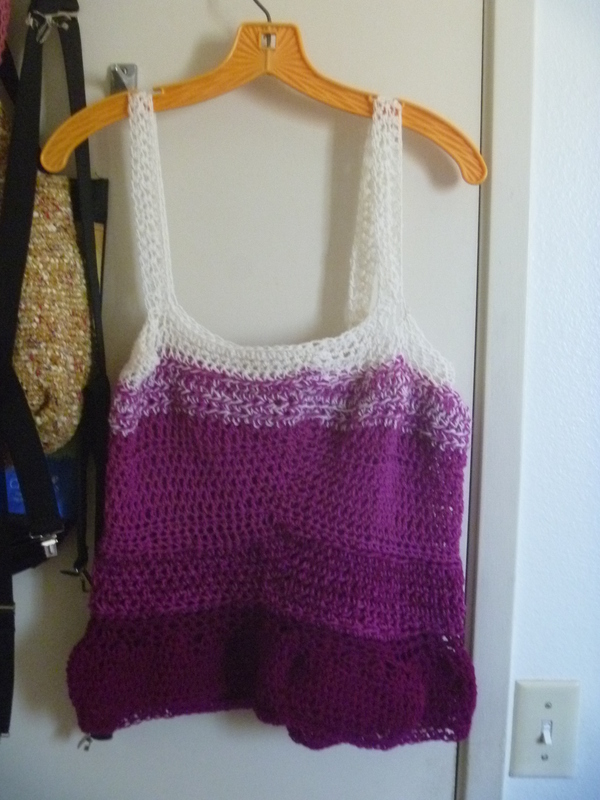 I added a little more to the pullover’s sleeves and finished this top. 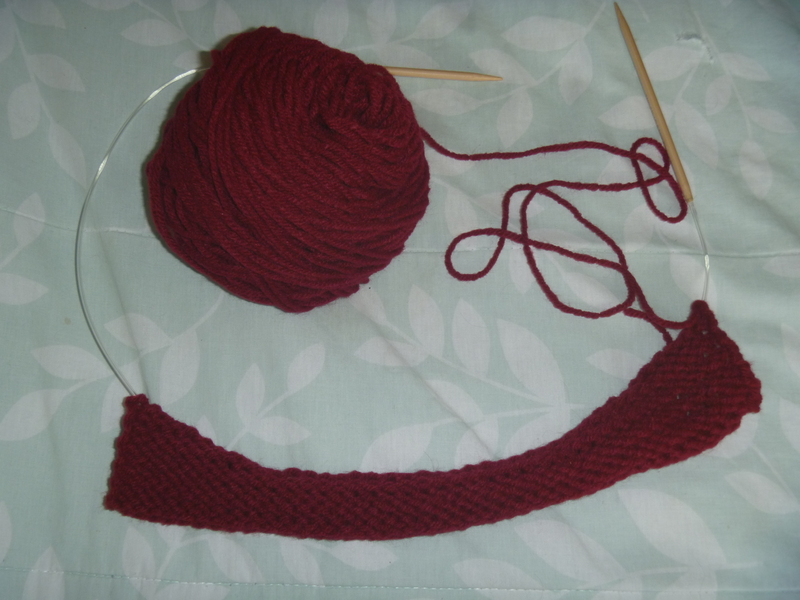 I’m tempted to make a small cowl to the neck but I like it the way it is. I have tried it on and it’s plenty loose and oversized. 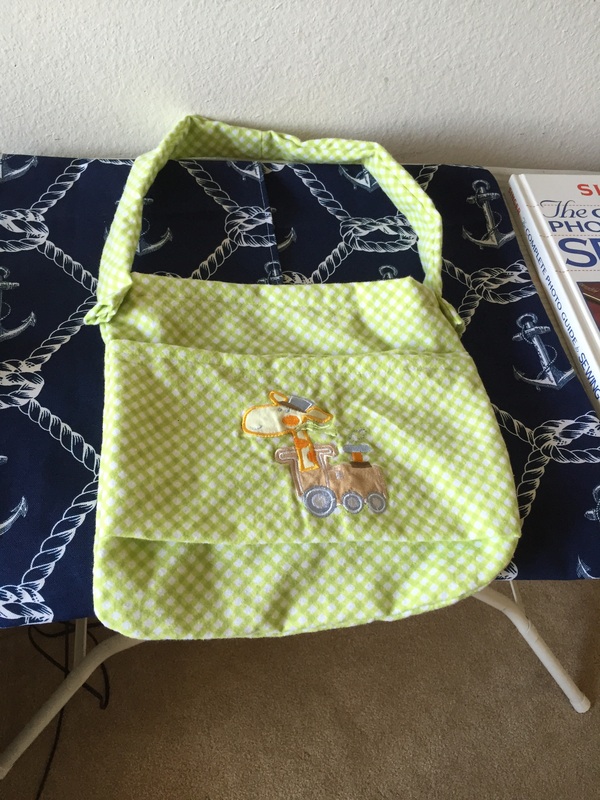 I posted this fabric on Instagram and reposted it on Twitter which reposted onto Facebook. My cousin saw it and requested a pillow made with it. 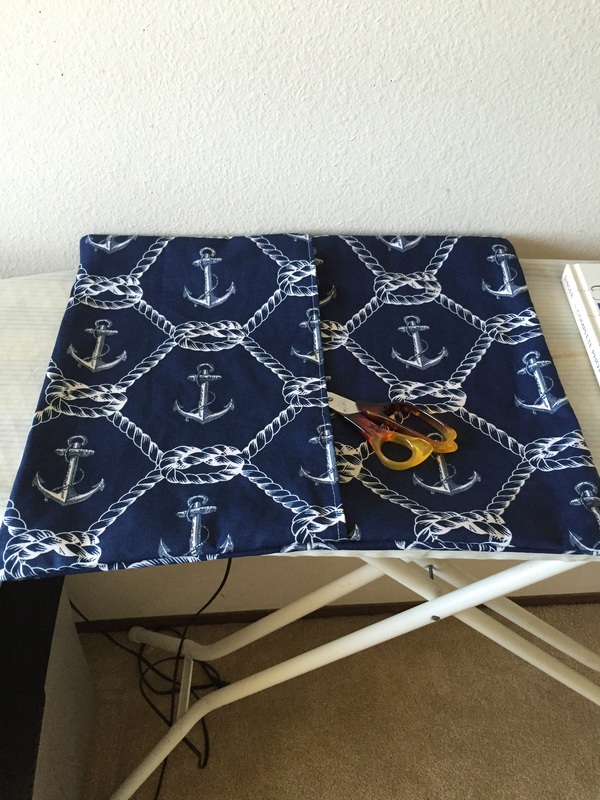 The pillowcase measures 12.5 by 18.5 inches. Have to gather up enough fabric scraps to make the pillow form to insert into the case, then I can send it to her. This former baby blanket has been sitting in the pile of fabric for To-Dos. I’ve been wanting a little bag to hold all my tools in one place but not sure this will be it. I’ve got a huge pile of projects to do. This is a huge project, in itself. My friend Mike came by and dropped it off in July. I originally agreed to fix the holes and the main zipper but decided to just make him a new one. I’m somewhat in over my head because I didn’t keep the pieces in their right piles and sewing it by memory. I should have taken pictures as I took it apart. The back is pretty much done. He’ll have it by next week. It won’t be perfect but that’s what happens. I’m not a factory. I’ve finally decided to open an online store, as opposed to putting things off again, because I need to get rid of things that are just taking up space. Thing is I can’t decide between Supadupa and Big Cartel. I’m leaning towards Big Cartel because I want to start smaller. I’ll link to it here and on my Instagram when it’s all settled. It will be under my name. 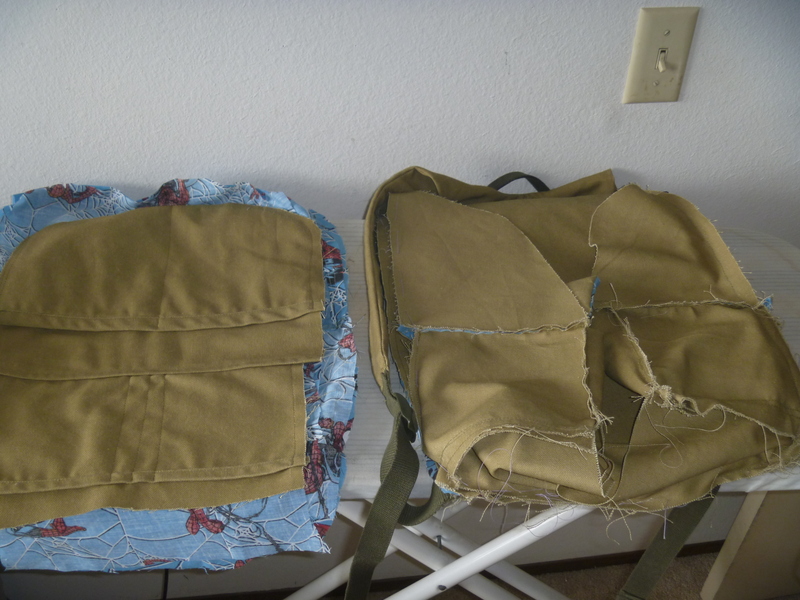 I finally started taking apart my friend’s backpack so I can use those pieces to make a new one. I didn’t realise there were so many parts. I’m sneaking in fabric, on the inside, from his mum’s stash that he gave me after she passed away. 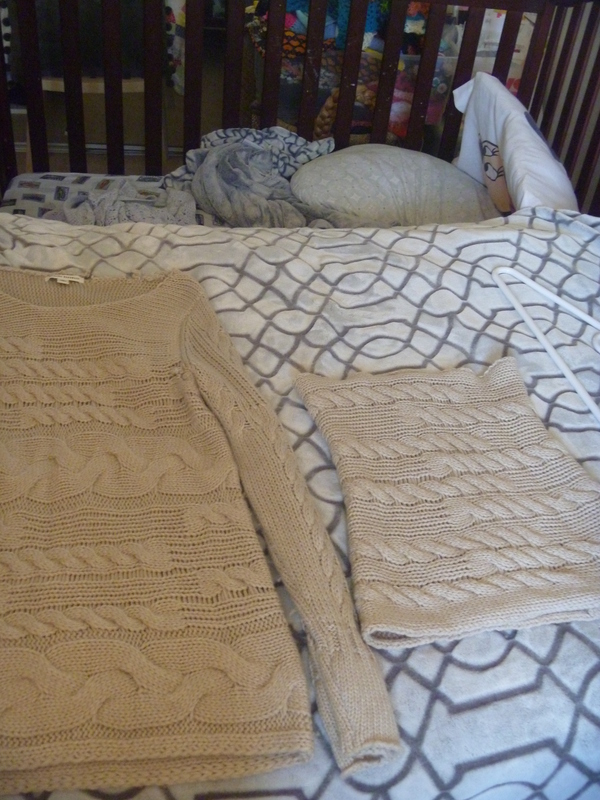 The pullover turned out to be bigger than I planned but still okay. I like really loose tops but haven’t tried it on, so unsure just how loose. 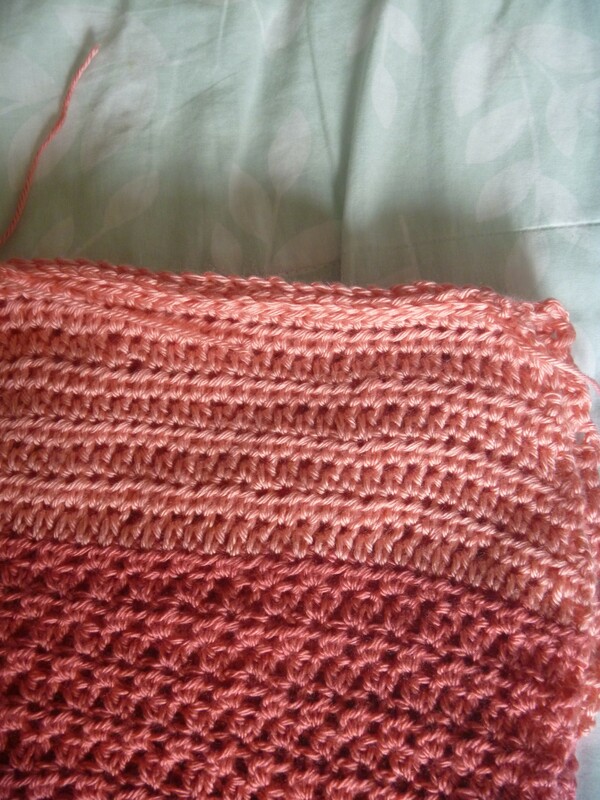 Only one shoulder has been seamed. Not sure how the sleeves will end up but will add to it if it is cap sleeved. I’ve almost finished with the roof by knitting a wee chimney for it. It’s just a matter of embroidery for windows, the main door and putting small eaves on a side, then stuffing the whole thing. I’ve nicknamed the house The Knob House because of the chimney. This is an experiment in what I will end up with. 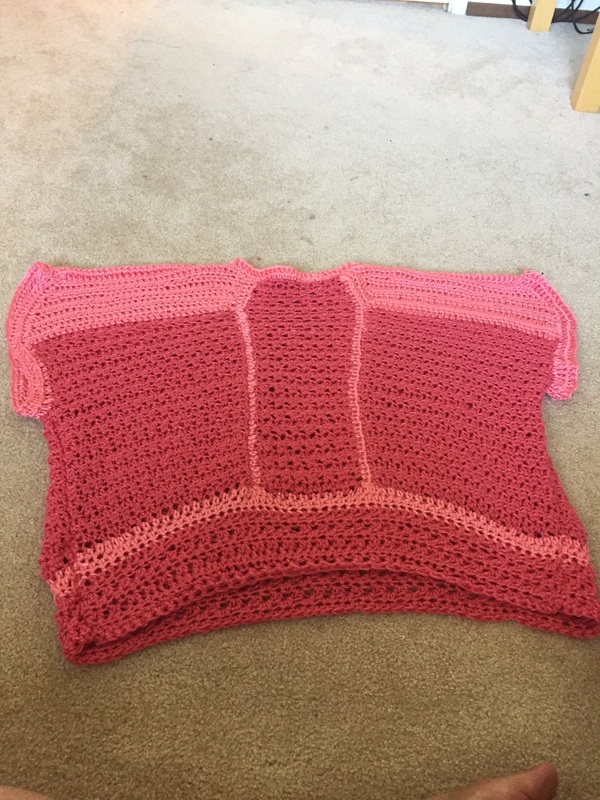 I assume it’ll be a small poncho but it’s not finished. 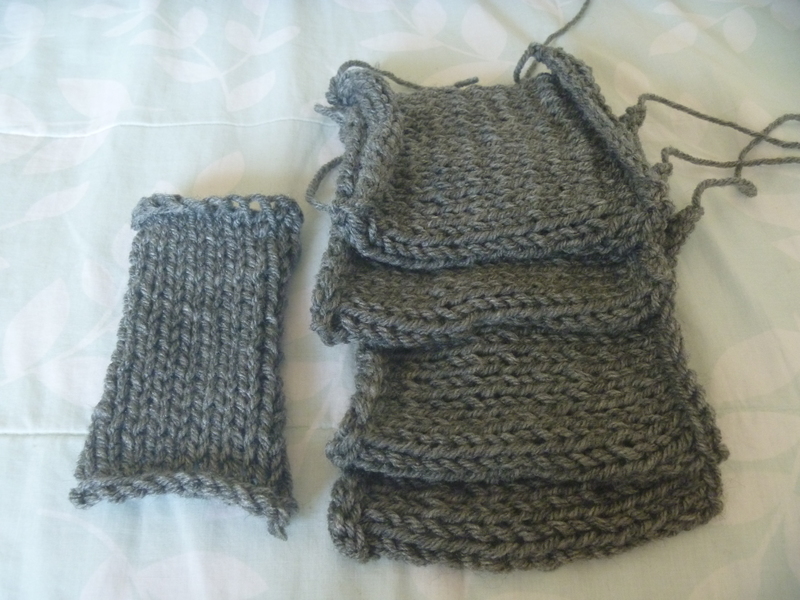 Frogged the smaller sides and decided to make the front and back first, so I know exactly how big to knit the smaller sides. Rather than doing the reverse. The tissue box is just to hold the walls and floors for now and a visual reminder to how big the whole house will become. The end product will be stuffed. 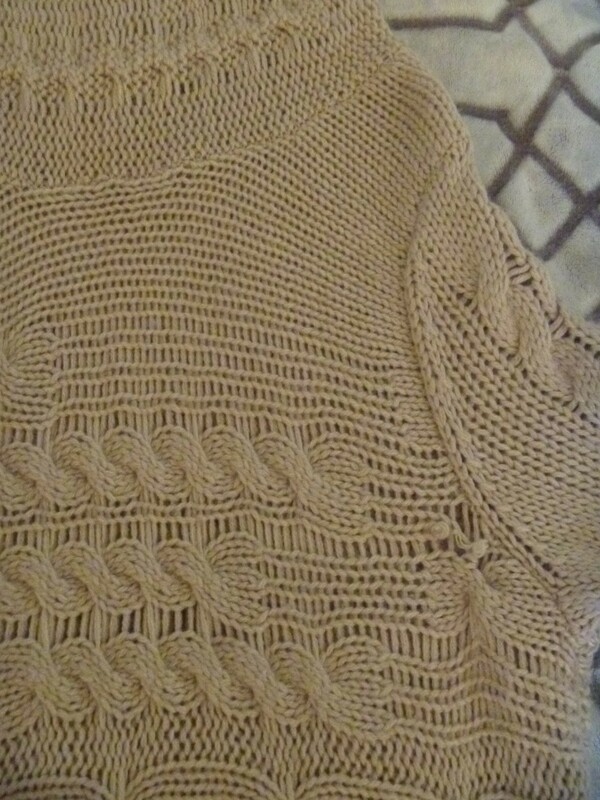 This is the slow progress of the cardigan I’m knitting. I only spent an afternoon or two on it. 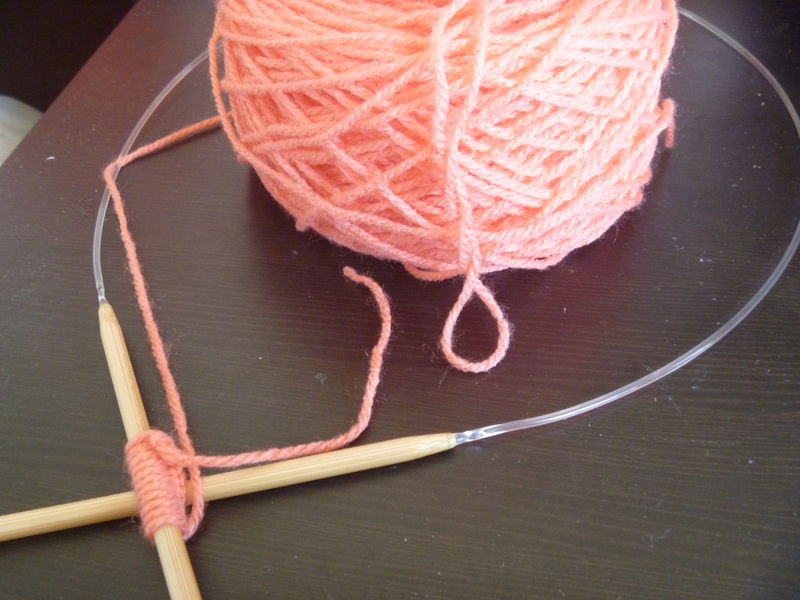 This is what bothers me about knitting. I’m impatient and my progress is extremely slow. The end result is always worth it, though. 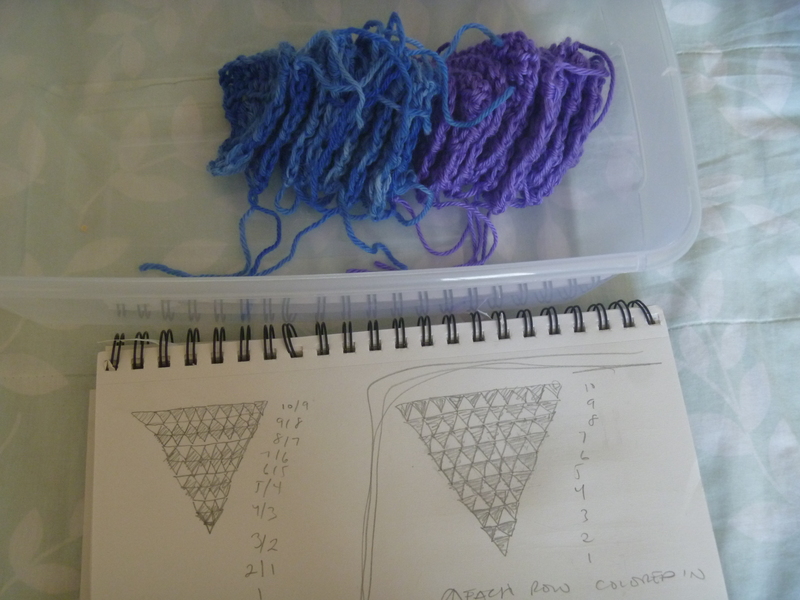 I was watching YouTube on Saturday and viewing random crochet videos and got an idea to make a triangular shawl made entirely out of triangles. It’s not a new idea but want to see if I like the end result. The color scheme isn’t finalized but I’ve decided on the second basic sketch. Either cream or off-white yarn will fill in the empty spaces, and to connect all the triangles. 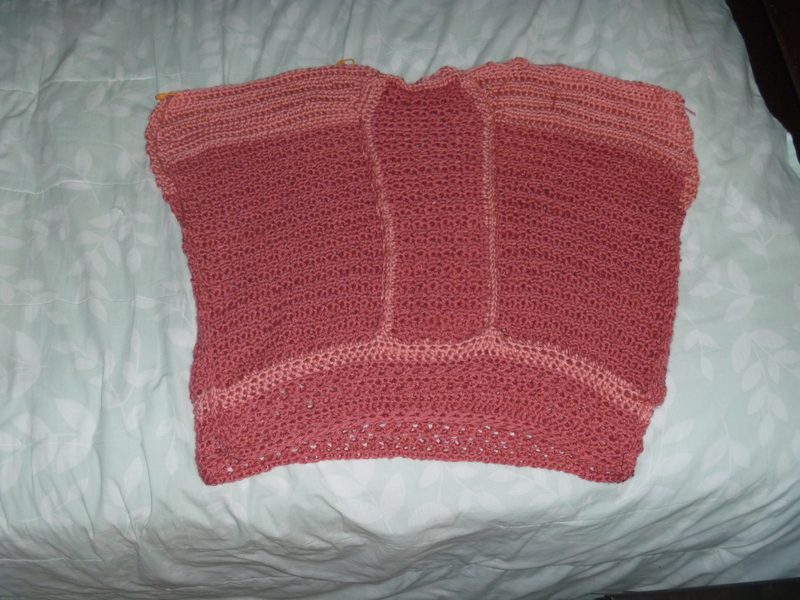 This is the crochet top/pullover I started last week. This is the back with a piece starting the front. They’ll mirror each other and the sides will be seamed. I haven’t decided if I want to add to it to make longer sleeves, because there will be short sleeves. Also, haven’t decided if I wanted to add on an edging. 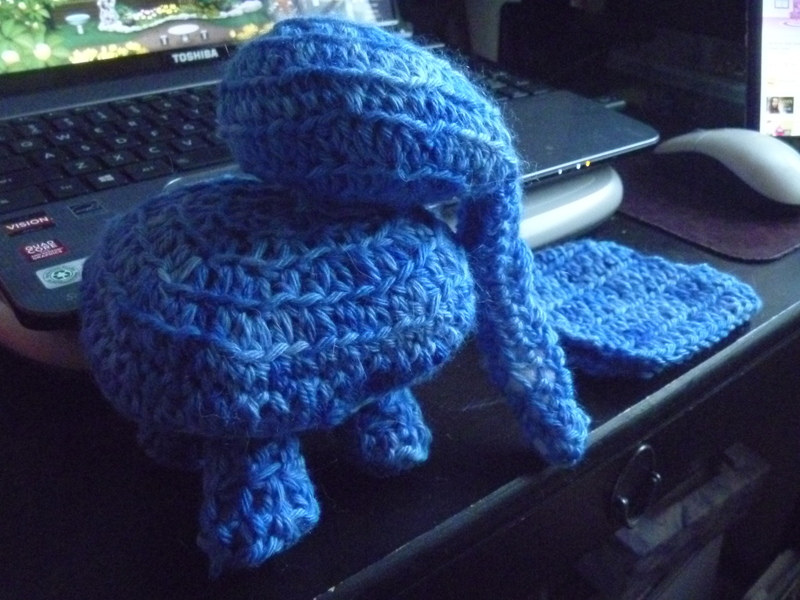 I attached ears to the crochet elephant and it’s slightly weighing it down even though the ears aren’t stuffed like the rest of it. Still undecided over the face and the tail. I’ve made more “coasters” and intentionally took them from the side so you can’t see the letter on top. I have to make at least one more, but all of these, except the bottom one, are all going out to different people in the club I’m involved in. By the way, I had a hard time making the letter M. Hopefully, the one it goes out to isn’t terribly bothered by the fact it’s horrible looking. 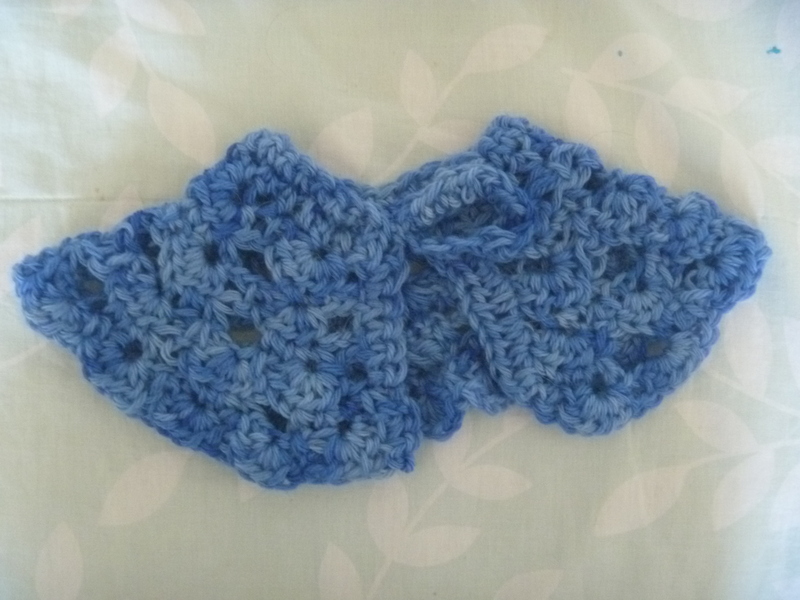 I tried crocheting the letter at least five times and each time, it looked less horrible. The one I’m sending is the first one after I made a decent looking one that didn’t fit the circle. I crocheted a little bowl using leftovers bits of yarn so it’s striped purple and blue. 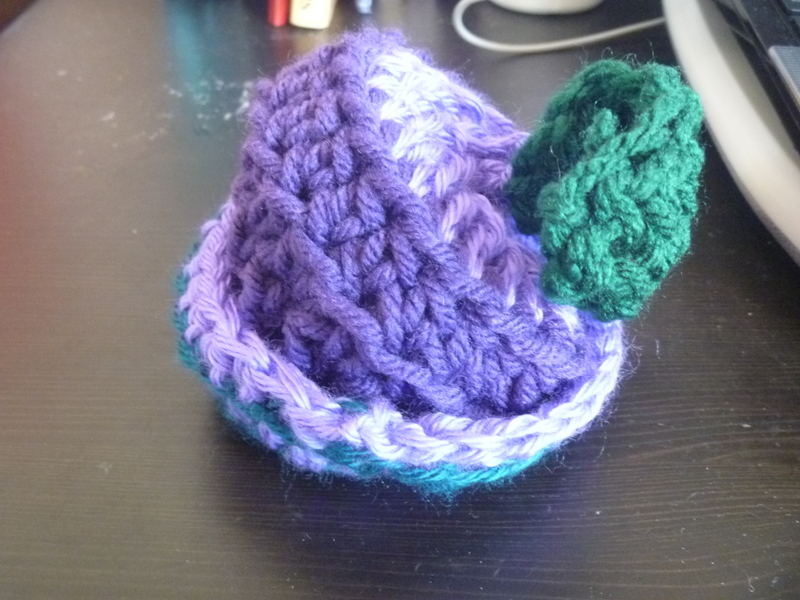 The “plum” on top was also made using leftover yarn. I added the two leaves because it looked weird by itself. After going through quite a few knitting books and magazines, I got it in my mind that I wanted to knit a little house. The pieces on the right, which still need to be blocked, are the walls. The one on the left was just leftover but I could try incorporating it into the rest of the house. I haven’t decided if I want to make the roof a dark red or a greyish blue, although every person I’ve asked (Okay, the only person I’ve asked) suggested the dark red. 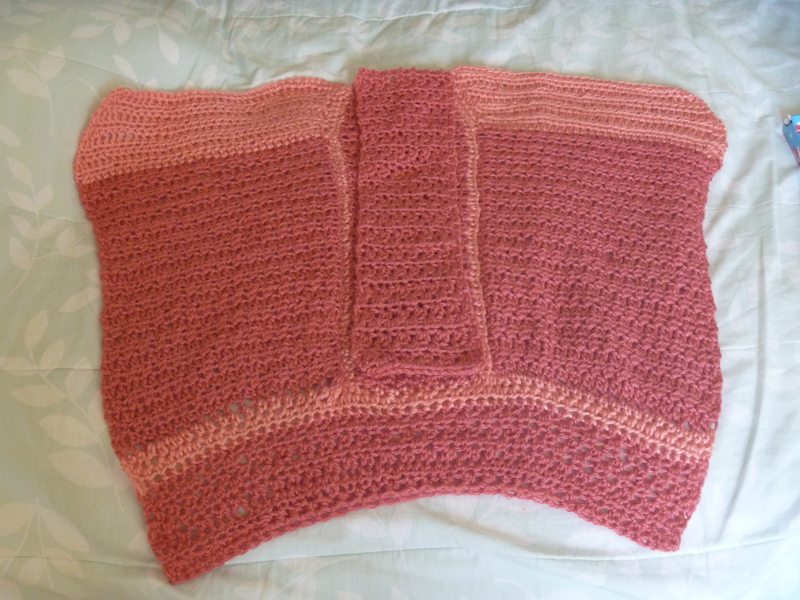 Also, have not officially decided if the roof should be crocheted or garter stitch. Once I have the yarn in my hands, I’ll know. Over the weekend, I cast on 129/130 (lost count after 120) stitches but got to row 10 and have no idea how I added stitches but made it worse. After getting to row 13, frogged the whole thing. 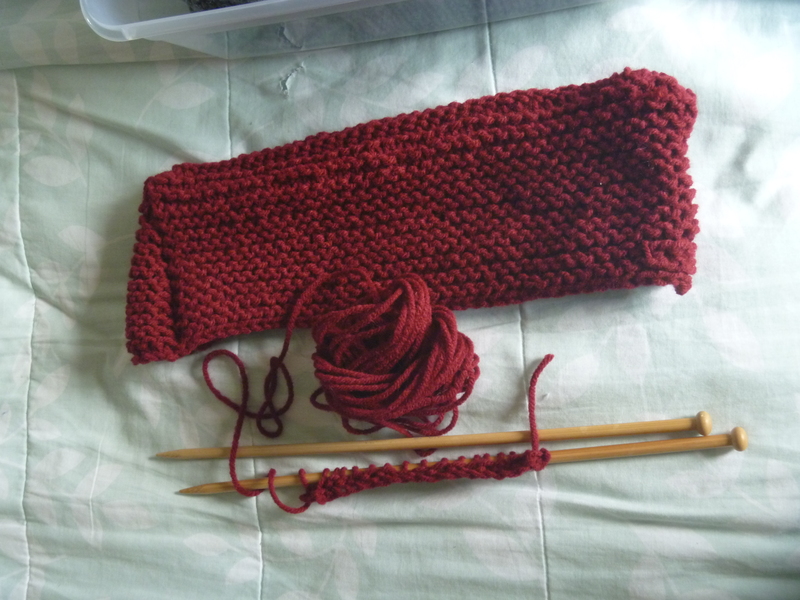 After I took it off the needles, I found it was too wide so it was a mixed blessing. This yarn has been sitting there for a while and I wound it all onto balls. 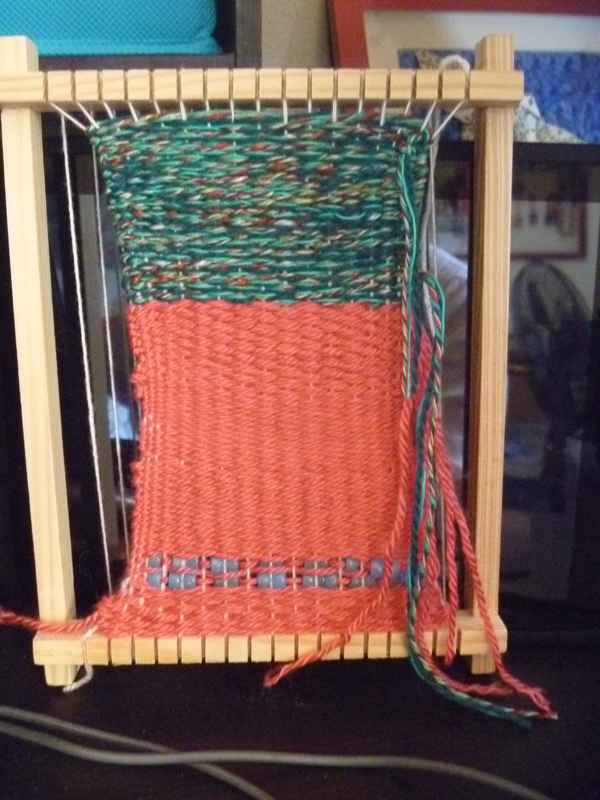 In total, nine, because of tangled yarn at the end. I am still in the planning stages but I’m making myself another cardigan. I’ve just cast on ten but the first row cast on will be 100. I’m going to start off by saying this sweater was around $168 and from Banana Republic. 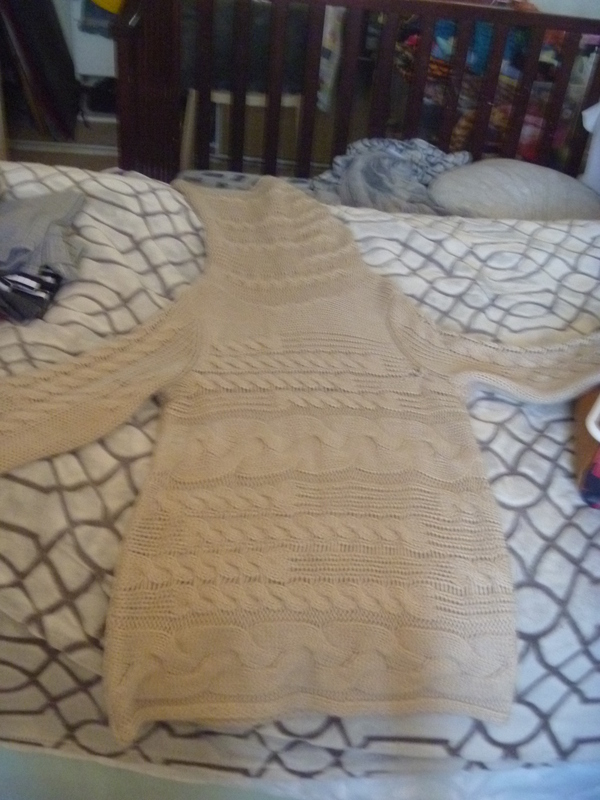 It was my favorite sweater and always got complimented every time I wore it. I got really sad that every time I tried to fix the hole in the front, that it kept getting worse, so I’ve decided to frog the whole thing and make another sweater out of it. The cowl will still be a cowl, though. 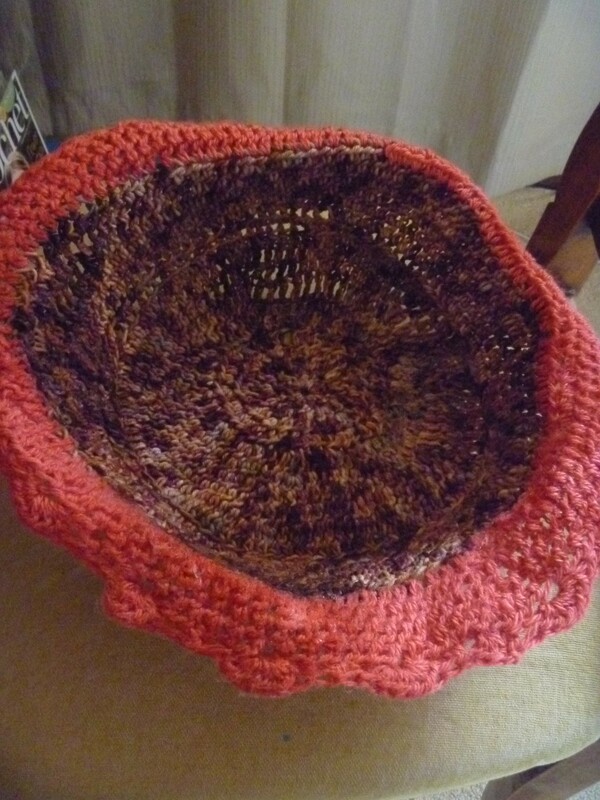 This bowl looks really wonky because I didn’t put enough Aleene’s Fabric Stiffener and Draping Liquid all over. 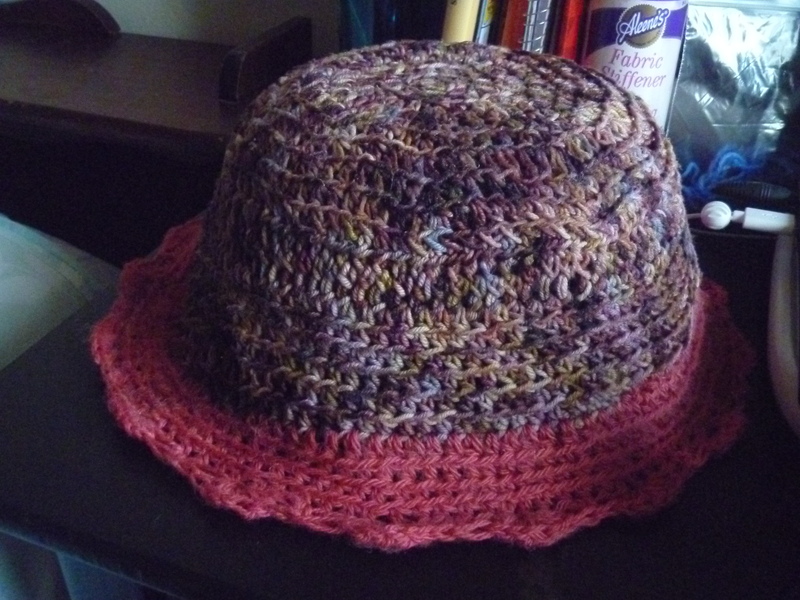 It would have worked better if I had diluted some of it with water, rather than pour it over and work it into the crochet with my fingers, because the bag method wasn’t doing the job. I also don’t have any containers big enough to completely drape the bowl over, so the edging is slightly curled over on purpose. I should have left off the pink border, also. There’s this little guy I’m working on. I haven’t attached the ears yet and I’m not sure what to do about his face or tail. Also, there is no name. The idea for the elephant came about while I made this. This still needs a button for the closure. 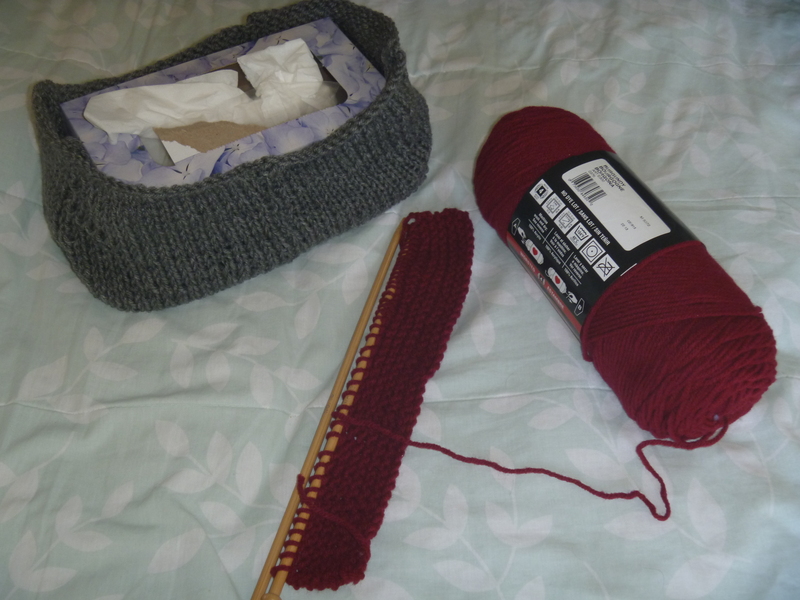 The last two projects were made from yarn I had made a scarf with that was sitting in the closet.